The manufacturing industry is undergoing a major transformation which is driven by smart technologies and IT, notably cloud computing. The main thrust of cloud computing is to provide reliability, scalability and on-demand provisioning of resources. According to industry sources, the availability in a distributed environment along with economically attractive pay-as-you-go pricing and instant provisioning of redundant resources to manage agility can be considered as some of the major factors for adoption in the manufacturing industry. The recent trends in IT such as internet of things, collaboration, analytics, smart manufacturing and many others are shaping enterprises worldwide. Manufacturing industry is diverse where cloud computing platforms can play a major role due to its benefits in enhancing agility, expanded flexibility, reduced costs and enhanced productivity. 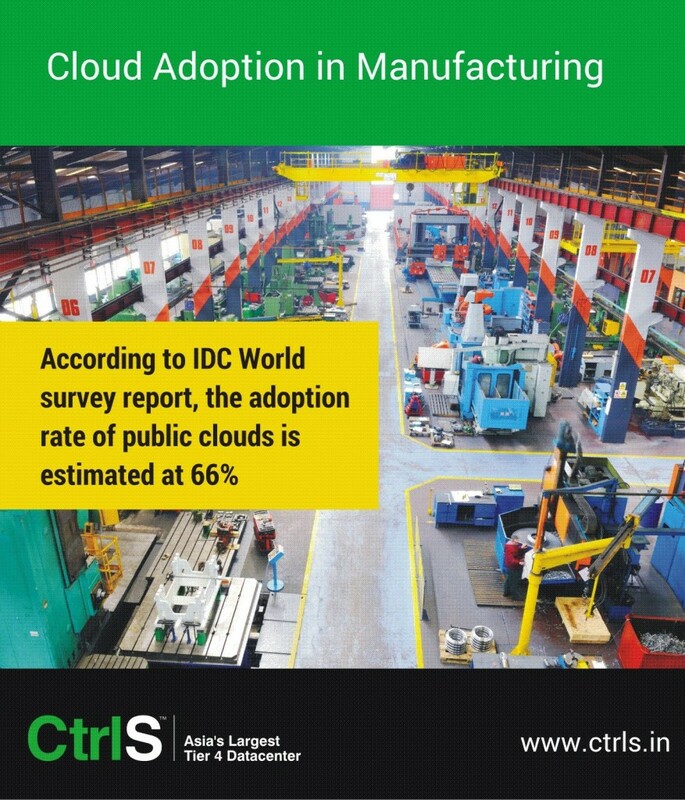 According to one IDC survey on Worldwide Cloud Adoption in Manufacturing Industry, trends show that the adoption rate of public clouds is 66% and 68% have private cloud, out of 593 respondents across 17 countries including India. Manufacturers pursue a cloud strategy to achieve business goals by focusing on business systems, processes, models and performance to develop long standing relationships with customers. To realize the full automation in industrial and operational management systems. Clouds due to their computing abilities ensure effectiveness in producing physical goods and to manage product lifecycles. Clouds provide efficient information flows along with easing complexities in implementing fully automated workflows in operations. Provide greater supply chain visibility and improved forecasting accuracy through the use of cloud based applications. Organizations are enabled for more growth, remain competitive and at the same time explore new markets. Offers the ability to solve system integration problems easily. Cloud based enterprise software, ERP, CRM, SCM systems and other manufacturing systems can automatically scale up or down as required. In addition to the above, cloud services offer the platform for continuous innovation, agility, ability to scale and flexibility, business focus and availability, cost savings and so on which are some of the other pointers accelerating cloud adoption. Some of the recent cloud adoption trends in global and Indian scenarios are explored a bit more and summarized here. Cloud adoption scenario in manufacturing globally: The IDC study provides insights on cloud based strategies in manufacturing that are oriented towards enterprise IT. Adoption in other manufacturing areas such as engineering and operations are proceeding with caution. In a recent Bain & Company study titled ‘Tapping Cloud’s Full Potential’, enterprise organizations are able to realize 35% of their total potential value from cloud deployments. However the reliance on cloud for integrating existing systems and for developing new business models is increasing steadily. The Enterprise Cloud Report 2015 from Cloud Sherpas, based on a survey shows that almost 66% of organizations prefer cloud services due to its agility – positioning IT to change automatically to alter capacities according to changing business needs. IDC Manufacturing Insights explains that manufacturing industry is in the middle of a digital transformation where manufacturers want to operate and service customers globally. Trends indicate there is more dependency on cloud service providers for technology resources and operational support at low costs. Clouds support manufacturers in realizing tremendous value in terms of speed, cost and accessibility however IT and line of business must be defined clearly to realize full benefits of clouds. Cloud adoption scenario in manufacturing in India: Cloud adoption in India is primarily aimed at overcoming challenges in legacy software, disparate systems, inefficient demand planning, high cost and low productivity. Indian manufacturing companies look towards adopting cloud models to implement collaboration and analytics tools, CRM, ERP, enterprise mobility tools and dashboards to share information and enhance accuracy in their production processes. Manufacturing industry in India is a major contributor for Cloud ERP market and according to Infoholic Research, cloud ERP market in India is estimated to reach $97.8 million by end of 2015 and growing. Estimates provided by Infoholic Research also show that manufacturing market in India is expected to grow at 19.4% CAGR from 2015 to 2020. The ‘Make in India’ initiative by the Government is providing a big boost to manufacturing sector with 24.1% contributions to the total cloud ERP market in India. In addition to this, SMEs are also implementing ERP systems on cloud platforms which can further promote cloud adoption trends in this area. Ernest & Young India news release on cloud adoption mentions that more than 60% cloud implementations focus on infrastructure consolidation by adopting IaaS. The manufacturing industry is rapidly virtualizing their servers and desktops along with SaaS platform for enterprise application deployments by many manufacturing firms. The Indian manufacturing scenario offers big potential for cloud adoption in 2016 and beyond. Government initiatives like Digital India and Make in India are expected to foster cloud adoption among manufacturing SMEs and large enterprises. Insights on Cloud Service Delivery and Deployment model adoption in manufacturing: According to IDC Global Technology and Industry Research Organization IT Survey, manufacturing respondents access IT resources via public clouds. IDC Manufacturing Insights survey and IT Priorities survey results show that almost 50% of European manufacturing firms had already adopted ERP in public cloud models. Manufacturers in Asia Pacific region are using a mix of public and private clouds with an adoption rate at 49%. IDC cloud adoption estimates show that 61.6% companies prefer to use public cloud services and another 56.8% are planning to replace their existing IT functionalities through IaaS and SaaS cloud deployments. A survey by EMC involving 900 respondents show that 88% respondents view cloud services as critical to their organization to realize digital transformation and 63% are already experiencing multiple benefits due to cloud adoption. Hybrid clouds seems to be the preferred adoption model to improve customer service, and EMC results show that 86% respondents are able to acquire new customers and another 82% are able to make real time business decisions. Hybrid clouds are preferred by manufacturers to implement their PLM strategies and applications. Verizon Enterprise Solutions 2016 State of the Market: Enterprise cloud report explains that almost 50% of surveyed respondents use a mix of public and private clouds for their IT resource. Hybrid cloud adoption is gaining momentum with cloud spending growing at 38% compared to 2014. SaaS and PaaS adoption found to be increasing as more and more organizations are using these platforms for implementing applications, web pages and for development and testing new software models. Industry estimates predict that 80% of new applications will be deployed on the cloud in the next few years. Indian manufacturers prefer to use open source technology and acknowledged OpenStack IaaS for its low cost and to avoid vendor lock-in concerns. SaaS platforms are emerging as a delivery vehicle for mobility, analytics and for handling big data projects. Verizon report also highlights that manufacturers prefer cloud based ERP implementations to improve their workloads and this market is increasing steadily. According to Gartner estimates, almost 30% companies in services will move their ERP applications to the cloud. Traditional ERP vendors such as SAP and Oracle offer IaaS, SaaS and PaaS products to extend existing applications to cloud or on-premise apps and to create and develop new capabilities. Oracle offers a PaaS platform in their cloud ERP solutions. Cloud service models are poised to provide significant value to manufacturers by integrating emerging technologies such as IoT, sensors, big data analytics and so on. In summary, cloud computing services are an effective way to access, analyze and share large volume of information across the manufacturing industry. This entry was posted in Cloud Adoption and tagged cloud adoption, cloud adoption in manufacturing on April 6, 2016 by admin. We are witnessing a scenario where cloud computing models are proving to be game changers across industries and IT organizations. Organizations globally are already moving towards the cloud and adopting cloud services in one form or the other for their operations. Though adopting clouds may sound easy, it requires careful planning and comprehensive migration strategies because the organization may undergo significant changes in their normal operations. Costs are optimized: Businesses look for optimizing costs as business grows and expands there is an increased utilization of resources and need for more hardware. Cloud models optimize costs by allowing organizations to hire services and resources which incur only operational expenses. The need for purchase of new hardware and infrastructure is fully eliminated which is a saving on capital cost. Further the cloud infrastructure is managed and maintained by the data center or cloud service provider which reduces the need for IT personnel. Enhanced agility: Clouds due to the method of elasticity can quickly scale up or scale down resources based on usage and workloads. For example, online retailers normally experience heavy usage of applications and network during festive seasons. Cloud models can efficiently handle sudden spikes in workloads without disruptions or breakdown. Improved cash flow management: Organizations face significant expenses in internal IT operations which are due to software licenses, storage, servers, communication costs, etc. In clouds capital costs are reduced into monthly rental cost for subscriptions, this improves cash flow management in the organization. The adoption by a variety of industries is largely driven by these business drivers, but cloud adoption is not just using the technology, rather adoption is a journey with extensive planning and strategies. First, a quick brief on how cloud models are used will help in understanding the strategies required for adopting the appropriate model for the business. Clouds have two main service delivery models: Private Cloud and Public Cloud. The third delivery model is a combination of private and public clouds and is called the Hybrid cloud. Private cloud services are owned and used by a company internally. For example, private clouds can be found in large enterprises where data, applications, storage and servers are centralized. Private clouds can also be hired from data centers. Public clouds are owned and provided by a third party or provider for use by external companies. For example, Google offers public cloud services in the form of email, storage, etc. Hybrid clouds are a combination of private and public clouds. A hybrid cloud will combine certain public cloud services with the internal or private cloud. For example, data and applications can be private, but the network and communication services can be external (For example, a VPN on the internet). IaaS: Provides the infrastructure for cloud services. Networks, servers, compute resources, data center, virtual fabrics, etc. PaaS: Provides the operating platform for cloud services, also known as middleware. OS, software development tools, databases, Java TM runtime, Web 2.0, HMTL5, and many other platforms are available in PaaS. SaaS: Offers all application instances for the cloud. Popular applications are ERP, CRM, E-mail, collaboration tools, etc. Cloud adoption strategies take into account specific business goals, best practices, cloud standards for current and future use by a company. A basic adoption strategy for any type of cloud model will consist of a series of steps that includes Assessment, Planning, Migration and Optimization. 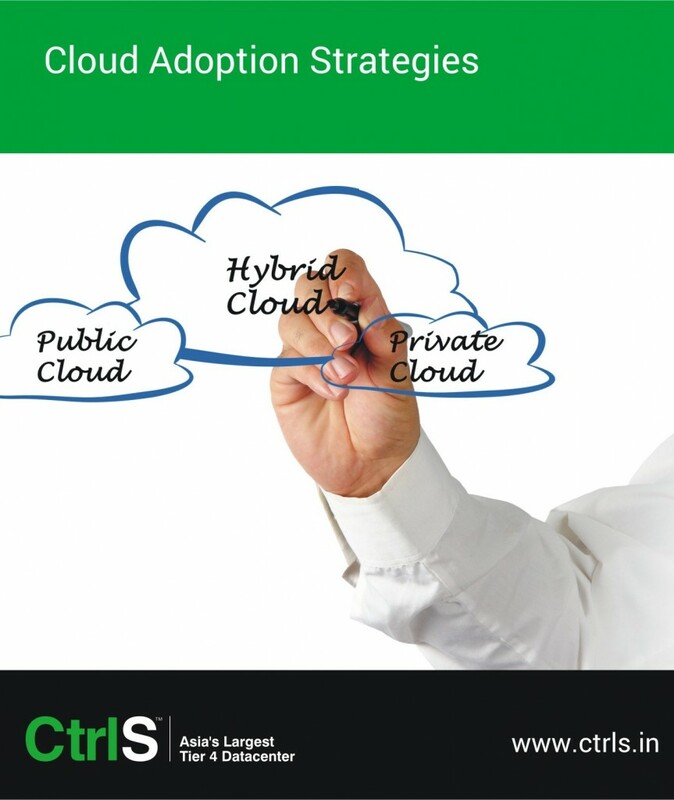 From the perspective of business the adoption strategies to consider for Private, Public and Hybrid clouds are explored and summarized in the table. Certain features in legacy applications can be protected. These applications may not work well in public clouds. Can also be hosted from a data center. Data centers maintain all managed services (web servers, application servers, load balancing and other infrastructure). No capital costs. Operational expenses only. Security is an issue. Companies must have adequate security planning to protect internal data. Data centers offer a wide variety of hybrid architectures, solutions. All cloud computing systems and services offer common benefits like elasticity, availability, scalability, and so on. Prior to adopting cloud services, organizations need to assess, plan and develop comprehensive cloud adoption strategies because each service model is different. Developing a well planned strategy will help organizations to deploy the most suitable model to optimize their business operations. This entry was posted in Cloud Adoption and tagged cloud, cloud adoption, cloud adoption strategies on March 15, 2016 by admin. Aviation industry due to its technical nature is focusing more on passenger needs towards developing more helpful personal relationships. The common approach is by deploying apps and by adopting new IT systems and technologies. According to Avionics Magazine (March 2015), 78% of all major airports will provide customer relationship apps to deliver personalized trip information and tailor made services by 2018. This is possible by converging technologies namely cloud, mobile, analytics and big data, since smart phones are mostly used by travellers worldwide to seek travel information. In order to handle huge volumes of data and multiple devices, airlines are partnering with data centers offering cloud services to outsource their IT needs. IT is pervading all aspects of human life such as health, retail, governance, entertainment and media, travel, education and so on. In this post we explore IT adoption trends in the aviation industry. Aviation industry is an important factor in travel and tourism sector that leads to increased economy for nations. IT systems, new technologies and services are proving the capabilities to enhance internal processes and improve passenger experience, meeting customer demands, compliance to regulations and cost reduction. Aviation sector in today’s scenario are high adopters of technology to reach passengers globally. In the context of India, aviation is one of the fastest growing industries where growth is accelerated by liberalization of the Indian aviation sector, which is undergoing rapid transformation due to low cost private carriers in the aviation market. According to South Asian Journal of Tourism and Heritage, private airlines in India account for more than 75% share of domestic market. The constant expansion by aviation companies needs robust IT systems, networks and technologies. IT adoption in aviation industry is likely to continue into the future, particularly in India which is an emerging economy. Market imperatives play a vital role in IT adoption in many operational areas. The demands for low cost flying, higher customer satisfaction, reduced risks, stringent regulatory standards, etc. pose unavoidable challenges faced by many aviation companies. Airlines due to their nature of business services struggle with huge quantities of data. Aviation industry reaches customers globally by working around the clock. Therefore airlines need resiliency and responsiveness in order to keep their air operations working efficiently. Reinvent aviation services: Cloud based systems offer aviation companies a choice of operating systems and a variety of technologies and tools simultaneously. Cloud services are outsourced with easy pay-per-use pricing model which is an advantage for airline companies to reduce upfront costs in purchasing and maintaining an in-house IT infrastructure and servers. Aviation companies by availing cloud service models are rest assured that maintenance and administrative costs are eliminated. Faster deployment of services: Airline companies by deploying cloud services can quickly deploy applications and software to provide important information in real time to passengers as opposed to emailing information and updates to ticketing agents. Information can be made available instantly to passengers on any device having access to the airline system (for example, text messaging, etc.). This reduces complexities in information sharing with passengers. In addition to service efficiency, cloud systems are scalable where IT resources can be adjusted to handle compute and network loads fluctuating with changing business needs. For example, Flight Discovery is a mobile based service to support passengers in overcoming baggage and travel issues with airlines. Improved customer engagement: The cloud enables airlines to connect and engage customers directly on mobile and social channels at very low cost. Such type of connection has the potential for building deeper relationships that benefits both the airline and customer. The airline can use customer information about his/her travel preferences to provide more customized services. Productivity improvements: With cloud services, the airline employees at ground level can have flexible working arrangements. Employees can use mobile devices or tablets to receive data and information at their fingertips. Airlines by adopting and deploying beacons to provide information on tablets by which roving employees or agents can help passengers to check-in, baggage drop and boarding to minimize queue lengths at counters. In addition to the above trends, airlines adopt business intelligence tools for predictive modeling, understanding trends and are investing in data centers to ensure their information is secured. The cloud SaaS model is currently used by 57% companies in aviation services and SaaS adoption is expected to reach 88% by 2018. 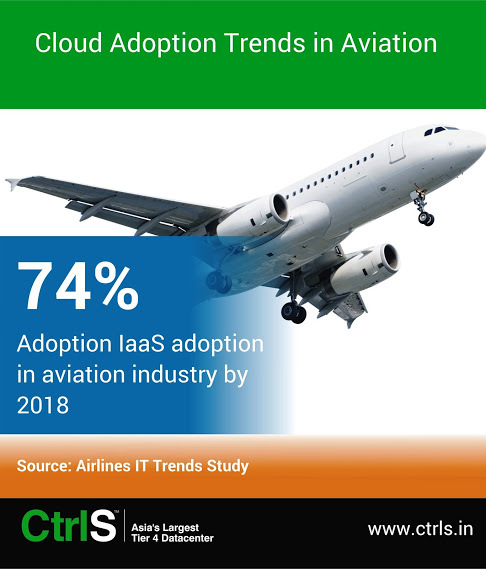 Similarly IaaS adoption by aviation industry is expected to grow over 74% by 2018 from the current adoption rate of 38%, according to The Airline IT Trends Survey Report 2015. Cloud service models having the potential to efficiently handle infinite number of apps and passenger connectivity are an ideal solution for aviation operations in terms of flexibility and low costs. This entry was posted in Cloud Adoption and tagged cloud adoption, cloud adoption trends, cloud adoption trends in aviation on December 29, 2015 by admin.